Rediff.com » Movies » Heroes who fly high, and look GOOD! Heroes who fly high, and look GOOD! Bollywood have seen many on-screen professions, but none is more dashing than that of a pilot. There have been quite a few who have played the role. The latest to take to the skies is Shahid Kapoor, who plays a pilot in his father Pankaj Kapur's Mausam. With his sculpted physique and raffish attitude, the Kaminey dude made a picture-perfect pitch as the first Bollywood actor to fly the F16 aircraft recently. Guess Shasha was inspired by the original showbiz aviator, John Travolta. Whatever the case, the 29-year-old looks dishy in the publicity pictures released a while ago. And being in the safe hands of his father, the least we can expect is a feisty performance. While we wait to catch the actor in action, here's a look at others before him. As Squadron Leader Veer Pratap Singh, the official showbiz lover-boy (even at 45!) made a heroic entry in Veer-Zaara when he rescued the dame (played by Preity Zinta) while being suspended hundreds of feet in the air. More than his dare-devilry, director Yash Chopra focussed on the romance of the moment, with Veer mouthing poetic lines to Zaara as they get introduced to the audience. And to each other. Love eclipses heroism, yet SRK looked every bit the fine-looking Air Force pilot. In this largely forgettable Raj Kanwar dud, what viewers may remember is Akshay in the role of an Air Force officer, who aspires to be a pilot, and Lara Dutta as an aircraft junkie. The two sing songs around trees and atop cliffs, and hold hands against the backdrop of jazzy red-and-white aircrafts. A trite love triangle which somehow seems to be a throwback to the 1990s, this 2003 film would have been lost to us if not for the hinterland radio listeners who continued to request its songs. Tut-tut. Unlike Akshay Kumar, his father-in-law left an indelible impression as an Air Force officer in the 1969 Shakti Samanta movie. If in Andaaz, Kumar Sanu-voiced numbers became an emblem of mediocrity in music, Aradhana's Mere Sapno Ki Rani turned out to be a signature Rajesh Khanna tune of the late 1960s and early 1970s. In a famous double role, Khanna flies high. Literally. Couldn't he have given a tip or two to his rather handsome son-in-law? Madhavan played Flight Lieutenant Ajay Singh Rathod of the Indian Air Force quite convincingly. However, one wished he'd kept his weight in check. Be that as it may, the ace pilot dies in a crash, unwittingly becoming the starting point of a revolution that was to shake India. Pop patriotism at its best, RDB continues to get good TRPs whenever aired on TV and girls still go ooh-aah over Maddy. Okay, so whenever you think of Silsila, you think of Amitabh Bachchan as the sensitive writer (not to be confused with the melancholic poet in Kabhi Kabhie). But there was another legend, Shashi Kapoor, who equally made quite an impression as the Squadron Leader. Sure, he dies in a crash, but not before the smashing Kapoor lent the film his trademark touch. Thumbs up to Monsieur Kapoor! It's a hot-potch; so many characters that you've lost count of who's who and who's not. Despite that, Wing Commander Anand Bajwa's (Shroff) leaves an impact. 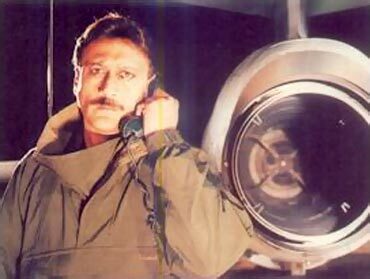 His timely arrival in the climax of this J P Dutta war-epic saves the day for India. A job Jaggu Dada must be surely proud of! What do you think of Shahid, Sonam's look in Mausam?